I made few more cards, but I will take pictures tomorrow as the light is really bad right now, pictures are turning out funny. 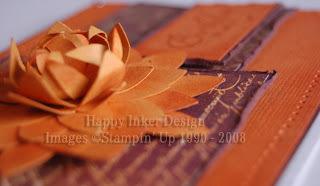 I finally received my pre-order from Stampin' Up. I got my scallop punch, In Color bundle and some other stuff from the old catalogue. I will play with them tomorrow. I will also try to do a little tutorial on how to make those lady bugs that all of you loved so much. Um WOW! That is stunning! Love what you did! I want instructions girl!!!! This is great! I love the 3D flower and the colors. I need instructions too! How did you do that??? What a fantastic idea worked up in great colors. This is just terrific. Looks like you curled up the petal ends - with a piercing tool? Oh, please, share with us! What a fabulous card! I love, love, love the rich and warm colors you used. Beautiful flower. Oh this is so cool how you made the flower! I really like the warm colors too! 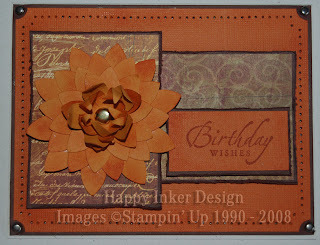 Love the dimension on this card! How fun! I wish it would rain here! Your card is magnificent! I saw the tutorial on that flower and haven't made one yet, but I want to! I love the colors you used in your card. Just found your blog through SCS and want to look around more!